**I was provided a product sample for the purpose of this Airbac Blog POP! School Rules feature. 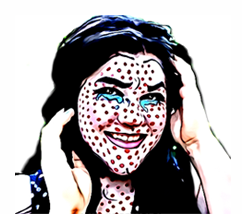 All opinions and images are original and copyright Momma Told Me Blog 2014. Momma Told Me: When I was a student I had to tie my books onto my back like a mule and hike 5 miles. When I was a student, okay so I still consider myself a student of life- when I was a grade school student, I remember thinking how cool it would be to finally have a locker. All of the 'big kids' campuses had these convenient metal boxes where ll of my books and binders would someday be stored off of my back, at last. Of course 'they' don't tell you that you'll only have 3 minutes between classes and most of your classes will be located clear across campus from your locker- thanks Momma. Still, by 8th grade I was glad to finally get some of that extra weight off of my back because, let's face it, one of the biggest pains of school is the one literally on your back. No, I'm not talking about the proverbial elephant of midterms and running home in time to steam open the teacher's note and do damage control before your parents find out- I'm talking about the backpack. It doesn't seem to have changed much since Momma's days; or has it? I remember when I was a tween (before the term even existed, mind you) picking out a cool backpack was one of the highlights of the new school year. My birthday, landing in August, meant that school supplies were pretty much guaranteed gifts, and I could choose the most gorgeous backpack I wanted. But style isn't tantamount to function, and I spent most of my years 'rocking' that fashion accessory slumped over like a less than graceful book toting gorilla. Naturally, there are some simple tips you can follow to help ensure your student's back health while at school (though I can't say that any of them are cool and will be used by said student.) The first, and most commonsense is to use both of the backpack straps at all time- easier said than done when slinging this pack over one shoulder and running to class is just plain more convenient. The second is to choose a backpack with straps no thinner than 2", which will not only cut down on unsightly marks an indentations, but also help distribute the bag's weight a little better. Third, if you can't ensure either of the first two, monitor your student's backpack weight. It should be no more than 15% of their own weight. While you may not be able to get rid of school books, look into lunch systems that can be carried outside the pack, heavy water bottles that may be adding weight, and trimming down the pencil box. While all of these tips are great, we all know that students are the least likely to monitor these things on their own. Having a backpack that is designed for back health and weight transport can ease your peace of mind and an aching student's back. 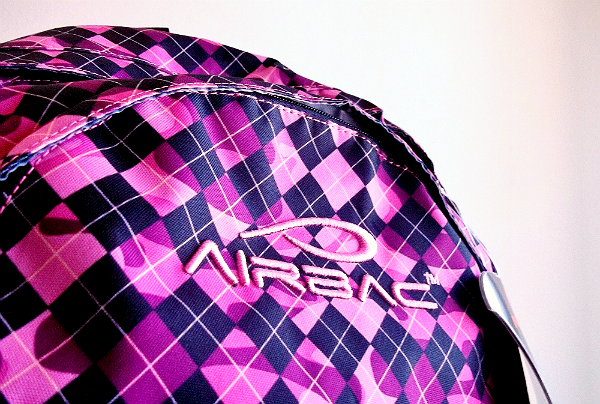 And while I am about to tell you about how awesome, structurally, the Airbac school backpacks are- what I find most relieving is the astounding array of colors and stylish prints they come in to maintain your 'cool' radar as a mom. And mothers with tweens and teens know having a stylish backpack is crucial; nobody wants an orthopedic backpack strapped to their back, right? (Hello, lamesville!) 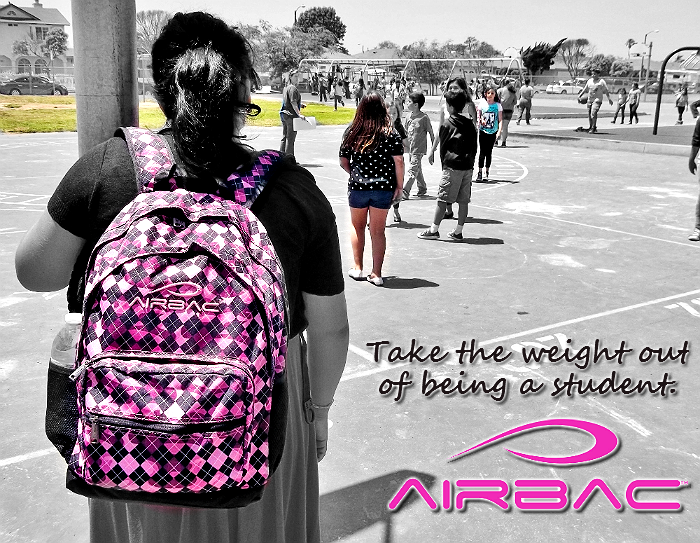 And not only does the Airbac brand offer several ranges of prints and colors, but 10 back friendly designs and styles of school backpacks as well! We were recently sent the Bump Airbac to test out at the end of this past school year. Sabrina (11) could've cared less to listen to my lecture about the innovative Airbac Support System; she was immediately enamored with the trendy and vibrant pink plaid finish that even had a touch of camp styling. Since she will be going to middle school next year, I knew she would be experiencing a new level of multiple classes and even heavier books- I was most concerned with putting the system to the test. 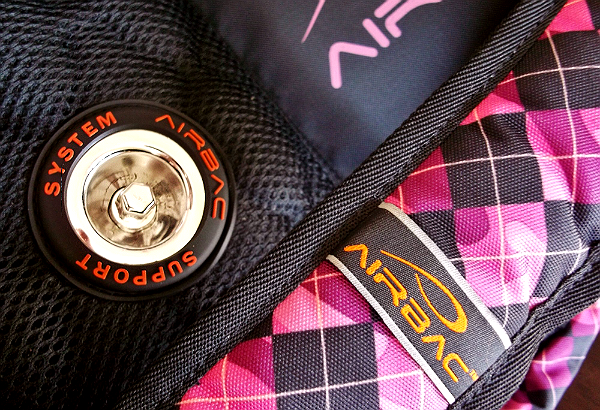 On the inside back of the Bump Airbac is the patented air support system which is easily adjustable via a futuristic looking valve. (It has a twist off cap similar to your tire valves.) This air support system is much like a pillow insert that can have air added or subtracted to meet the wearer's preference. It not only separates the direct weight of the bag's contents from the user's back, but lifts them up to make the weight carried higher, and more off the shoulders. This distancing of contents results in a pressure relief for wearer and promoted healthier posture as a whole. It also cups around the bottom of the bag's contents to provide extra shock absorption for modern electronics devices. I doubled the contents of Sabrina's Bump Airbac and was surprised as she told me it 'felt' lighter than her usual backpack (success!) I tried to ask more probing questions about comfort, but she soon began exploring every nook and pouch for all of the bag's cool features. 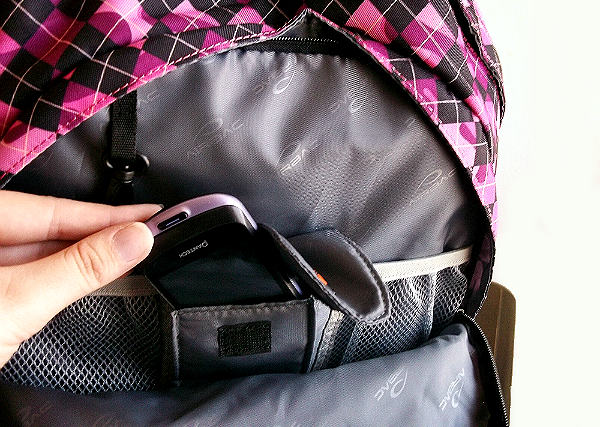 Her favorite was the internal (hidden) cell phone pocket where she could store her emergency phone during school hours away from sticky fingers in her class. There was also an internal laptop sleeve that I know will come in handy with the school issues iPads next year! What's practical and healthy isn't always cool or fashionable; it's a lesson we all have to learn the lard way at one time or another. Thankfully, that lesson won't be at the cost of Sabrina's back. 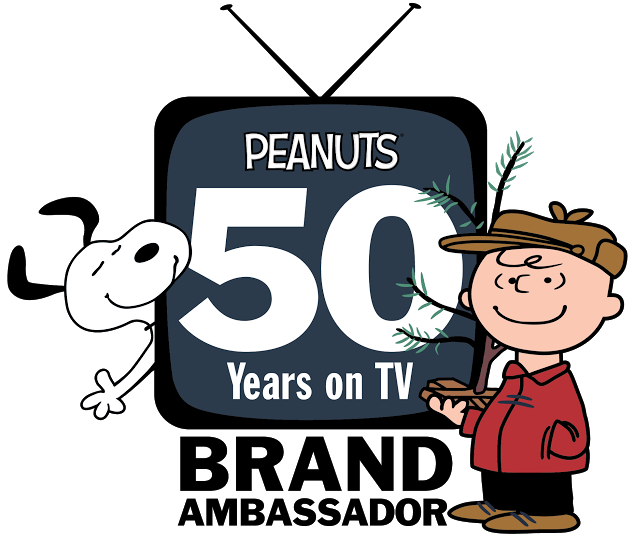 What Daughter Says: As fun as the torture tales of childhood are, when looking back, back pain is one I'm glad Sabrina will no longer have to recall. 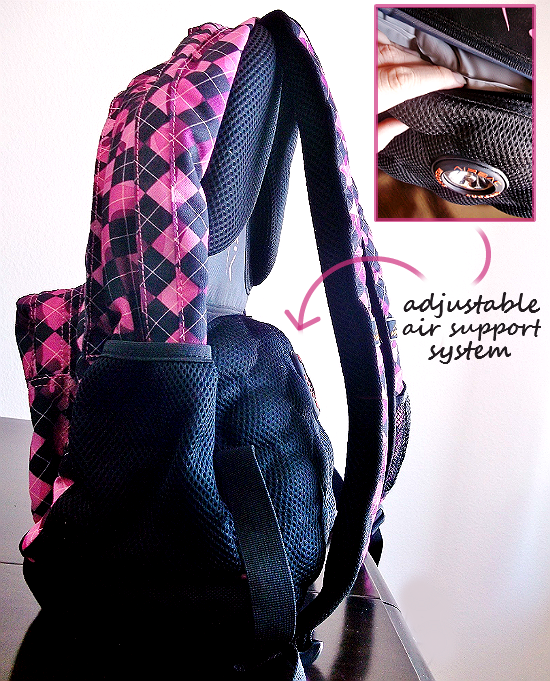 One Momma Told Me reader will win an Airbac Bump backpack! 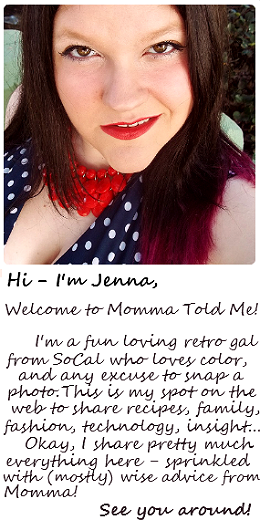 a Rafflecopter giveaway Follow along and hop on over to the next Blog POP! 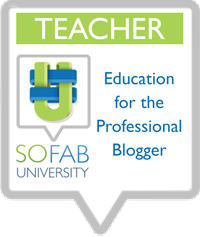 School Rules giveaway with the LINKY below! I think my son would really like the Blazer Backpack-Green. I know it would have to be more comfortable to carry. What a great backpack! I wish they had them when I was still in school! We could definitely use a new back pack...ours is falling apart! We actually just got this backpack and it is awesome! It is so durable! I can always use a new backpack! This looks great. I like the Layer backpack in grey. My son likes the Bump Backpack. I love that it's trendy looking and good for his back....no comprimising. I'm a middle school teacher and have seen more than my fair share of HUGE backpacks. On tiny little 6th graders, this seems like it would be a huge strain on their back! I'm glad that Airbac has some ways to lessen the load for kids. Oh, and my favorite is the Groovy backpack. My daughter would love the tie-dye. I like the Transit backpack- in gray! Curve Backpack in violet she would love this one! My daughter would love the Bump in the Pink Plaid or the other pack with the Groovy Purple Tie-Die pattern. I don't even think I had a backpack growing up. For the life of me I can't remember what I carried my books in! Oh that is such the truth. I have used every kind of backpack and they all hurt eventually. I would love to experience the The Airbac system to see if how it works! The Black Airtech Backpack would be perfect for my middle school grandson. I like the groovy backpack. My son would love the Bump Backpack in black! I like the Orange Layer Backpack. My granddaughter would love the Groovy Purple Tie Dye backpack. I like the Groovy Blue Reflection Backpack. My son would like the Blazer backpack. I think my daughter would like the Jungle Backpack. I would like the Transit bag. I like the Groovy Backpack - groovy blue best. Thanks. I think my grandson would like the Layer Backpack in Grey Blue Star the best. I love that pretty argyle print! The AirBac Backpack System looks so cool. I bet that my son would love to have one of these. This is a great take on backpacks. 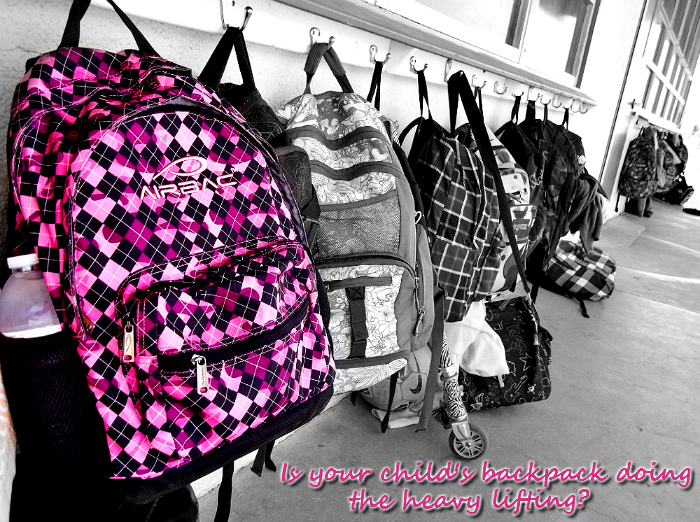 Backpacks can wreak havoc on the back. This adjustable air support system will feel so good on growing backs. I like the curve in pink!!! Those are awesome! 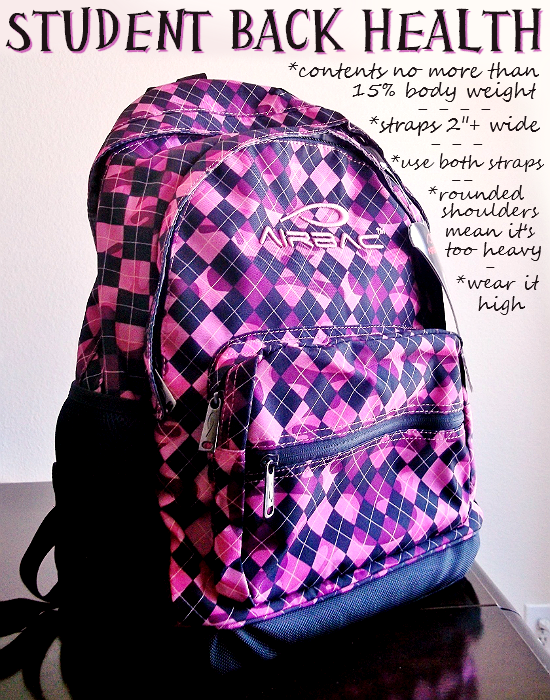 My favorite one is the Bump Backpack in Pink, just like yours! I rally like the groovy backpack and I know 2 of the kids would love it as well. My stepson would love the Groovy grey camo backpack. They look big enough to hold everything also. I love the pattern but I especially love that is it good for the kids and their backs. Very interesting product. Thanks for sharing. My daughter really likes the Bling Bag in the color pink. She likes the sparkle. The Mesh backpack is great! My daughter would like the Grovey Backpack. Carrying that cool backpack would defiantly make her stand out as really a cool girl. I like the AIRBAC backpack because it wouldn't cause any damage to her back when it was full of all those heavy school books. Plus with the air support there wouldn't be any reason she couldn't bring her homework home because the book was to heavy. Way to go from all the parents. My daughter would like the Groove backpack! My stepson would love the Transit Backpack. I like the Bump Backpack in lime for my son. I think my daughter would like the Groovy Backpack. Visited and my son would love the layer back pack. I like the layer backpack. My son would love the lime green bump backpack. My daughter in Highschool would like the Curve backpack. I like the AirTech Backpack in Blue. I actually think my son would ike the Bump backpack best. I like the layer backpack in Grey Blue Star! I think the simple black AirTech Backpack would be perfect. What a great idea! I could have really used one of these in high school. No lockers and had to carry so many books. So bad for your back! Looks so comfortable! 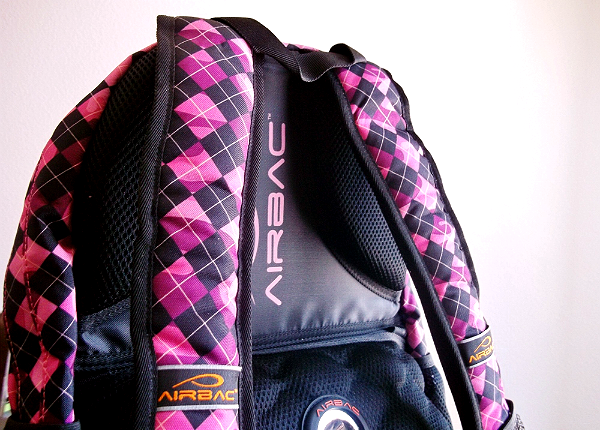 I think my daughters favorite backpack would be the AirTech Backpack. I also like the ring backpack. It would be good for my high school aged step son. We would love to have the Air Tech in yellow. The Layer Backpack looks great! I like the Groovy pack. My child would like the Layer Backpack. She'd like the tie-die Groovy Backpack best. Thanks. My daughter would like the groovy backpack. I like the RING BACKPACK!